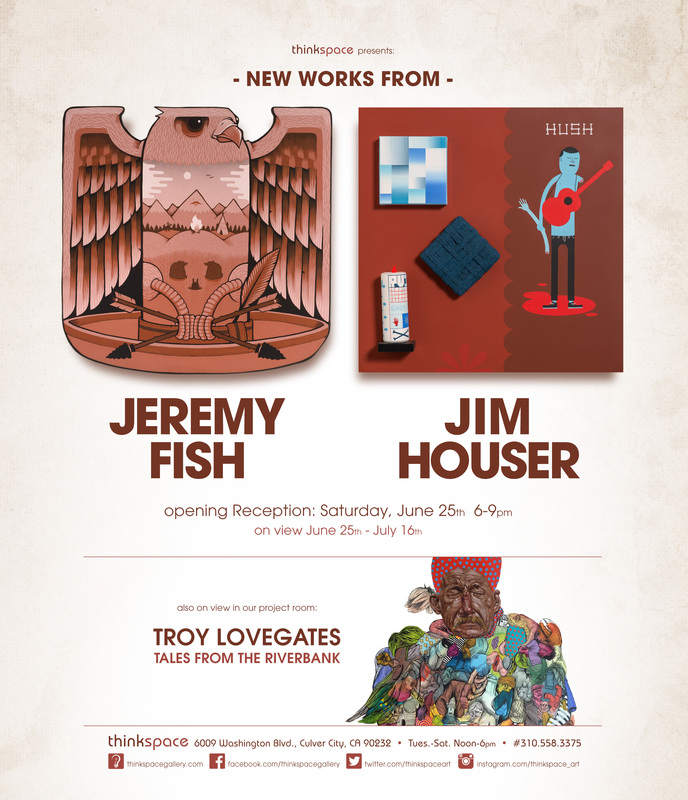 (Los Angeles) – Thinkspace is pleased to present New Works, featuring artists Jeremy Fish and Jim Houser. Two phenomenally influential and distinctively stylized artists, Fish, and Houser both came to their love of art making through drawing, music, and skate culture. Fish, originally from Albany New York, moved to San Francisco in the 90’s to set up camp at the age of 19 in North Cali’s skate mecca, eventually studying screen-printing and painting, and completing a degree at the Art Institute of San Francisco. He went on to work commercially as an illustrator, designer, and art director, contributing to apparel companies and magazines like DLX, Think, Thrasher, Juxtapoz, and Slap. Houser, an unmistakably iconic artist, known for the concision and poignancy of his graphic style, is self-taught and based out of Philadelphia. He began his successful career, much like Fish, in search of a creative outlet linked to the music and subculture in which he was immersed at the time. Since Houser’s pivotal discovery of painting, his complex mixed-media works and installations have been exhibited all over the world. Fish and Houser’s styles are respectively singular and distinct, but both share some commonalities, including an illustrative sensibility that can only be cultivated through years of compulsive drawing. Each has taken their foundation in graphic paper-based imagery to new dimensional depths, exploring ways in which to translate the two-dimensional physically, sculpturally and through installation. They both share a personal and emotive approach to creating imagery that conveys both individual struggles and universally relatable themes, coupled with a poetic knack for allegory and storytelling. Fish’s cleverly constructed animal object hybrids strike a balance between the playful and the macabre, while Houser’s collage compositions are selectively systemic worlds of personal symbolism, revealing a limitless interconnectivity. Inspired by children’s books and cartoons from the 70s and skateboard graphics from the 80s and 90s, Jeremy Fish’s world is both playful and dark, inhabited by animals, phenomenal graphic motifs, cool cars, and classic vans. He creates a whole cast of animal characters inspired by the cities and scenes he loves and the personal and human conflicts he observes. Last year, Fish became San Francisco’s City Hall’s first-ever artist in residence, creating a body of work based on the iconic city he has called home since 1994. In celebration of its centennial, he created 100 pieces of mixed-media drawing based on San Francisco’s urban history and its civic hub, which were exhibited in a special project in November entitled, O Glorious City. If that wasn’t enough, the city further showed their thanks for Fish by proclaiming November 19th to be “Jeremy Fish Day” from here on out. In this new body of work for Thinkspace, Los Angelurkers is a return to a more lighthearted Fish as he celebrates everything he loves about Los Angeles, in spite of his steadfast North Cali allegiances. In an attempt to cut out any unnecessary negativity from his life, following his recovery from a serious brain aneurysm in 2014, Fish has spent most of this year hunting down this imaginative world of mythical creatures from the recesses of his ingeniously offbeat mind, revealing a cool and playful world of fantasy and nostalgia. Jim Houser creates beautifully concise and graphic works with a superabundance of information and imagery. Known for his use of collage, assemblage, and installation techniques, he is inspired by the combination of drawing, painting, and language. Houser converts assembled compositions of two-dimensional materials into more complex objects, panels, or sculptures. He begins with individual paintings on paper which he then assembles into composites. An artist who works with a poetic stream of consciousness, his pieces evolve from edited outpourings of personal associations to reveal poignant visual narratives and meditations. The simplicity of Houser’s palette effectively offsets the intricacy of his clean, linear graphics; blood and the sea inspire his preference for the primary combination of blue and red, for instance. This elemental succinctness allows Houser to channel complex themes, concepts, and psychological states through a graphically striking restraint. Inspired by everything from children’s art and science fiction to music and disease, Houser explores the interstitial spaces that tenuously separate beauty from disaster. His desire to “celebrate the negative” through his works reveals an appreciation for the thematic proximity of devastation to joy, and of gain to loss. With obscure and often cryptic references to recurring words and motifs, Houser’s pieces reveal a patchwork of beautifully interrelated ideas and fixations. Houser has done commercial work for the likes of Toy Machine, designarium, and Nike and has exhibited in museums and galleries throughout the United States, Europe, Australia and Brazil.